December 12, 2012 /1 Comment/in Chenille Stem Ideas, Christmas Ornaments, Pony Beads /by Craft Supplies for Less, Inc. These Beaded Wreath Ornaments are fun for all ages! Simply string Green and Red Tri-Beads on a Green Chenille Stem, twist top, and attach a Red Velvet Bow. No glue or cutting required! Great for holiday parties and group crafts. Beaded wreaths can be used as tree ornaments, gift tag holders on presents, or as window decorations! Finally, an easy Christmas Craft that is fun and inexpensive to make. Kids of all ages and adults too will enjoy making these Beaded Wreath Ornaments for the tree this year. They are simple to create and add lots of sparkle to the tree. Year after year you can hang these Christmas Wreath Ornaments and remember the fun you had making them! Isn’t it nice when you make a handmade ornament and it doesn’t look like you made it at home?!? 1) Start by making piles of 5) Green Tri-Beads and 1) Red Tri-Bead. It will take 11 piles to make 1 wreath. 2) Then begin stringing beads on a 12″ Emerald Chenille Stem in the following pattern: 5 green, 1 red, 5 green, 1 red, etc. Leave 2″ of chenille stem showing at each end. 3) Continue with this pattern until there is about 2″ of chenille stem uncovered at each end. 4) Bend Chenille Stem into a circle and twist the ends once or twice to secure beads. 5) Make a loop with the chenille stem ends. Twist ends around each other to hide ends. 6) Attach Mini Red Velvet Bow with gold chenille stem (already attached to bow). That’s it! The wreath is done and ready for your tree! 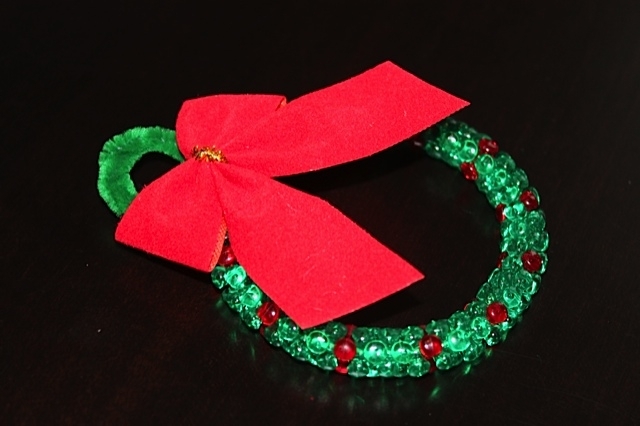 Each wreath requires: 55) green tri-beads, 11) red tri-beads, 1) 12″ emerald chenille stem, & 1) mini red velvet bow. For classroom or group use, count out 11 piles of beads (5 green & 1 red) and place in 3×4″ poly bag. Finished wreath ornaments are about 3″ across. Hang on windows with suction cups. 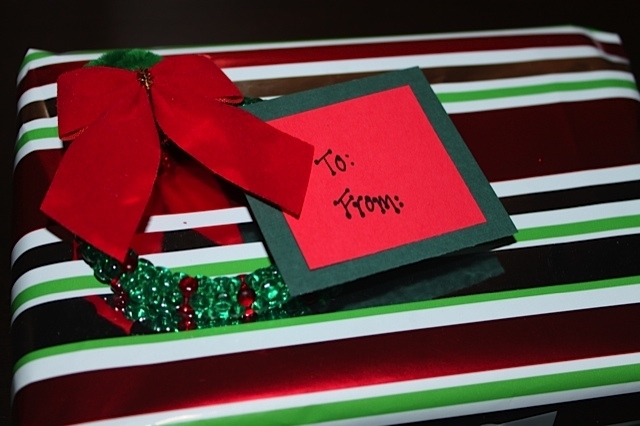 Add a gift tag and attach to the top of presents. Wonderful post. I always learn something interesting from different blogs every day of the week. Thanks for sharing!